With funding from the Heritage Lottery Fund, the church worked in partnership with The Video College to support a group of 20 young people in producing a documentary about the restoration of the church’s organ. The film will be on display for visitors to the church. Young people were fully involved at each stage of production. They were involved in research (taking notes and reporting back to the wider group) and in the management of the shoots (producing call sheets, booking equipment, taking part in recces and risk assessments). 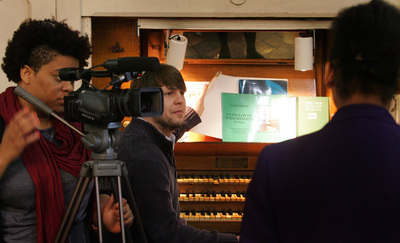 They first filmed the organist explaining the defects in the organ; in August 2012, a group went to Devon to film the process of the restoration and in July 2013 filmed the restored organ being played at the church. They worked with industry tutors in planning the shoots, with the young female director (15 yrs old) on the Devon shoot meticulously reviewing the first rushes in order to create a shot list for the editor. The organ originally came from Holy Trinity Church, Clapham, where William Wilberforce and the Clapham sect worshipped. With additional funding from the Grove Trust we were able to take a second group to film an interview with the vicar. 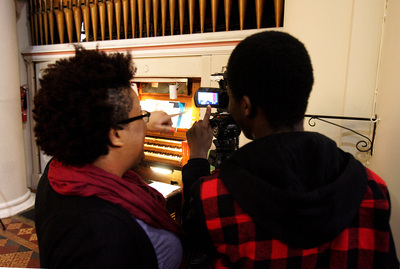 The young people greatly benefited from working with industry tutors on a commissioned production and communicating as a professional crew with the organ restorers, church staff and the public. They also learnt about the history and complex mechanics of church organs that produce different sounds; and the detailed work needed for restoration. For more info, visit www.thevideocollege.co.uk.